Sweet jam is an especially tasty pairing with tangy, creamy goat cheese. Combine the two on a slice of good bread or a cracker, and you're in for a real treat. Serve goat cheese and jam for breakfast, as an afternoon snack, or even for dessert. Peach (and apricot) jam are especially good with goat cheese. Although fig jam and tomato jam are quite nice, too. 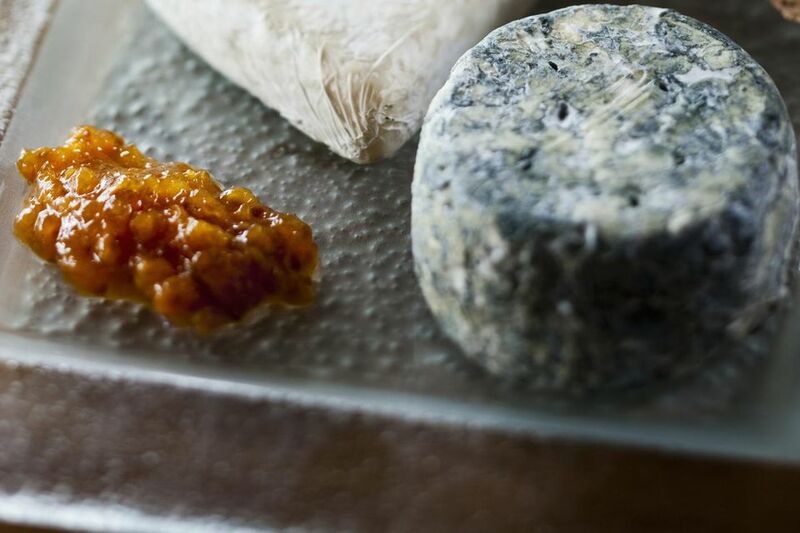 The easiest way to serve goat cheese and jam is to set out a crottin, pyramid, or log of goat cheese and a jar of jam. Serve with slices of good bread, or crackers. What Type of Goat Cheese Should I Serve? Really, any type of soft goat cheese pairs well with jam. Some types of soft goat cheese have no rind, some are covered in bluish-gray ash, and some have a soft, wrinkled rind that turns into a thin, harder rind as it ages. All of these types of rinds are edible. Goat cheese is sold in a variety of shapes and sizes. Log: A log or cylinder shape is a common for fresh goat cheese. Logs can be cut into small, individual rounds (medallions) or serve the log whole, with a knife on the side to spread the goat cheese on bread. Crottin: A crottin is a small roundish or drum-shaped piece of goat cheese. Crottins vary in size, but are usually just a few ounces in weight. Pyramid: A traditional shape for French goat cheese, many of these pyramids appear to have their top cut off, so the top is flat and wide. The story goes that this was an order from Napoleon, who demanded that the pointed tops of the cheese be removed so he wasn't reminded of his military failings in Egypt. Examples of pyramids are Valencay and Pouligny-Saint-Pierre. Puck: Some types of goat cheese, like Selles-Sur-Cher, are sold in a shape that resembles a small hockey puck. Fresh goat cheese is also called chevre (pronounced "SHEV-ruh" or sometimes "SHEV"). Chevre is the French word for goat. "Fresh" refers to cheese that is soft and creamy and has not been aged for very long. The texture does not have to be completely spreadable. Some types of fresh goat cheese have more of a soft, chalky, crumbly texture. The salty, piquant flavor of blue cheese also pairs very well with sweet fruit spreads. Another type of cheese that pairs well with jam is brie. Here is a recipe for brie baked with raspberry jam.